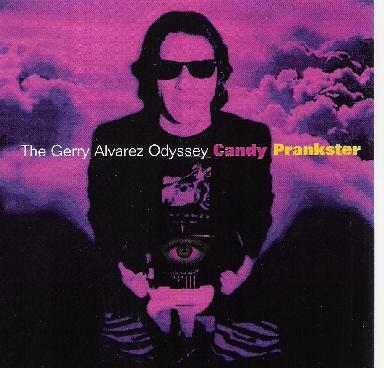 The Gerry Alvarez Odyssey - "Candy Prankster"
Man, I used to love The Gruesomes back in the 1980's! No, I'm not talking about that creepy family who were neighbours to The Flintstones, though I think that's where the band got their name. I'm talking about that group of crazy kids with the long, wild mop tops, who, in an age of overly synthesized dance music and watered down alt-pop for the masses, were belting out psychedelic garage rock to other Canadian kids like myself who were craving something that wasn't Madonna or REM. Well, Gerry Alvarez and his old band The Gruesomes are apparently back together again, but over the interim, Alavarez spent a lot of time working on his own material for this, his solo debut. Obviously wanting to do something that was different from what his band does, but still allow him to pursue his love of psychedelic rock, Alvarez eschews the garage approach for a tighter, fuller sound. This is like guitar based album oriented rock with Beatles style pop melodies. Actually, I have to admit though, after the first 3 or 4 tracks, I didn't find it to be really very psychedelic at all. More just some good, solid rock tunes, with perhaps a bit of a psychedelic edge. But Alvarez was just warming up, because then along came Urban Shaman, with its swirling trippiness and evocative melody. This was the song where it also struck me what a great lyricist Alvarez is, tackling unique subjects with literate style, a sense of humor and obvious pleasure. Another highlight of the album is the Tomorrow Never Knows-like Heaven, with lots of fuzzed out guitars, Eastern tinges and tripped out vocals. Open Up Your Mind has a bit of a George Harrison feel to it, with some descending melodies that send shivers up the spine. The epic 7-minute album closer, The Trail, has a bit more of a Lennonesque feel to it, with lovely strumming acoustic guitars, a searching melody, and some very freaky guitar fills, and it all builds to a glorious conclusion. Okay, so Alvarez is not about to give The Beatles a run for their money. But who is? I don't think that's his intent, anyway. This is just simply an album that oozes with Gerry's obvious love for that band, but also for psychedelic rock in general. A first-class collection of original tunes to groove to! For more information you can visit the Gerry Alvarez Odyssey web site at: http://www.gerryalvarez.com.